October 26, 2011 | Meagan Miller & filed under Fundrive. The time has come once again to search the couch cushions, break open the piggy banks and rifle through the coat pockets, because the CJSR annual FunDrive has returned on FM 88.5 Edmonton. Starting at 7 am on Wednesday October 26 until 6 pm on Saturday November 5, the volunteers at CJSR turn to their listeners in Edmonton and around the world to ask for their financial support, to ensure that another year of diverse community radio programming can continue to thrive. 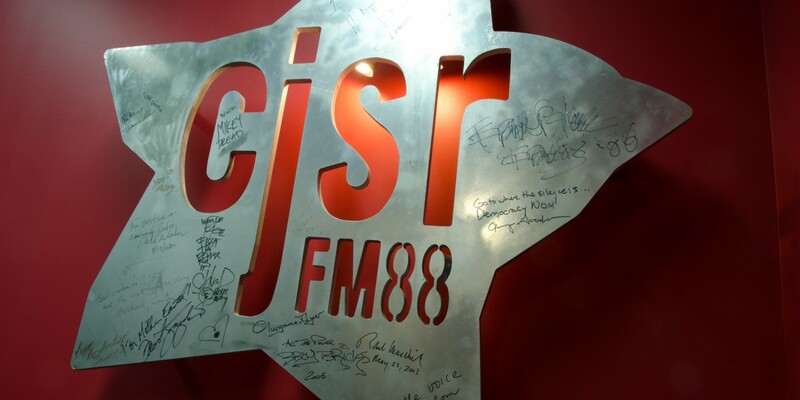 While the volunteer-run station is able to generate needed monies with alternative fundraising and limited advertising, the 10 day FunDrive is where CJSR turns directly to its audience and asks for help , with the hope of meeting its goal of raising $125,000 – which will cover over a third of CJSR’s annual operational costs. “The annual FunDrive is the time when the station could be no closer to its community,” says David Johnston, aka David Stone, host of CJSR’s Saturday mix show BPM, and current president of FACRA (First Alberta Campus Radio Association), CJSR’s governing body. Kicking off with the Moose Brothers’ popular Clockwork Orange Juice show on Wednesday morning at 7 AM, this year’s edition of FunDrive will treat listeners with a showcase of the station’s extraordinary and diverse news, current affairs, cultural and music programming, from the award-winning programs Terra Informa and Fourre Tout, to the fascinating talk show Skeptically Speaking; from the hard rock attack of Mind Compression and Heavy Metal Lunchbox, to the wonderments of ’68 Comeback Special and Calling All Blues. In addition, a number of veteran CJSR personalities will return to the airwaves to present exclusive revivals of their programmes. As usual, donations will be rewarded with splendid, exclusive FunDrive swag, which includes a recyclable grocery tote, a thermal travel cup, the iconic CJSR headphone design t-shirt, branded ear-plugs for that next live gig, and a “winter survival package” that includes a toque, scarf and knit gloves, all detailed with the CJSR star logo. As well, donors will be treated to the FunDrive digital compilation, featuring exclusive tracks from a number of Edmonton’s best local bands. At the end of FunDrive on Saturday November 5 at 6 pm during BPM, a draw will be made for a grand prize “Golden Ticket”, courtesy of The Starlite Room and Prime Box Office, which will entitle a lucky winner a guaranteed pair of spots on the guest list for every show taking place at the Starlite Room in 2012. Donors are encouraged to make their pledges online at www.cjsr.com, or by calling 780-492-2577 (CJSR). Donations may also be made in person from 10 am until 7 pm at CJSR’s World Headquarters in the basement of the Students’ Union Building at the University of Alberta campus.